Put the rice and two-thirds of the cream into a heavy saucepan and place over medium heat. Stir together and cook for 2-3 minutes. Mix well and then add the milk and all but two tablespoons of the sugar. Cook on low heat for another 10-15 minutes. Once the rice granules are soft and the liquid has more or less evaporated, add the remaining double cream and the rosewater. In a clean bowl, whip the egg whites to soft peak stage then beat in the remaining two tablespoons of sugar. Pour the rice pudding into a large oval or round ovenproof dish. 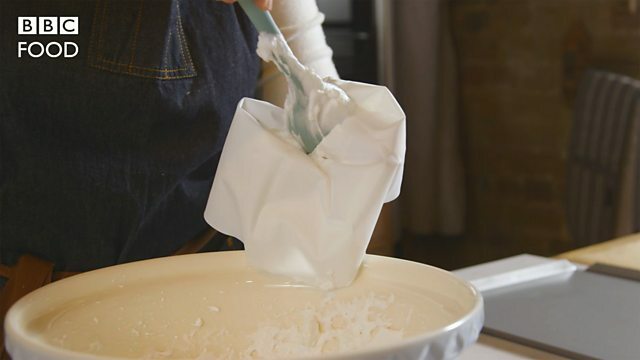 Using a piping bag, pipe the meringue mixture on top of the rice pudding to form peaks. Alternatively you can spoon it over the top in peaks. Bake in the oven for about 8-10 minutes or until the meringue has become slightly golden in colour. Remove and allow to cool slightly. Serve garnished with fresh rose petals, if you like.